Square-wave voltammetry was used for trace determination of azoxystrobin and dimoxystrobin in potatoes, grapes, and grape juice. Experimental conditions have been optimized to achieve simultaneous determination of these analytes using the hanging mercury drop electrode. Supporting electrolyte was HCl 0.1 mol L−1, and other optimized conditions were deposition potential (−300 mV), deposition time (30 s), amplitude (150 mV), frequency (150 Hz), and step height (2 mV). Azoxystrobin and dimoxystrobin redissolution peaks presented their maxima, respectively, at −928 mV and around −650 mV. Linear and homoscedastic analytical responses (r 2 > 0.99) have been observed. 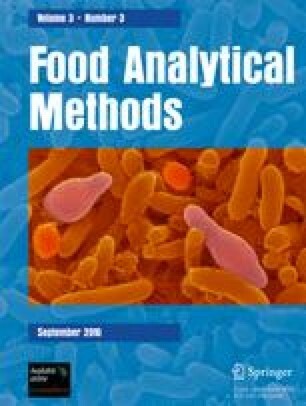 Limits of quantification as low as 119 µg L−1 (in grape juice) and 45 µg kg−1 (in potatoes and grapes) were found. A previous solid-phase extraction was necessary to eliminate interferences from potato and grape samples. For grape juice, no sample treatment was required. Satisfactory recoveries (from 72.3% to 96.7% for dimoxystrobin and from 81.7% to 102.3% for azoxystrobin) were found. Interferences from other strobilurins (piraclostrobin and picoxystrobin) were evaluated. The authors thank FAPERJ, FINEP, and CNPq for scientific grants. Aucelio and Pacheco thank CNPq and FAPERJ for scholarships. Statsoft-Brazil is acknowledged for supplying the statistical package used in this work.